I used the transmitters within 25 feet and had a decent line of site. They seemed to connect and drop at random times. A loud pop occurs from time to time and i was expecting this as stated by previous reviews, it's more annoying than i anticipated. Trasmitter uses a standard two wire rca connector for the trasmitter off the reciever and a one wire subwoofer input for the subwoofer connector and my sub does not have that capability. Not a good experience, i returned the item. I love this product because of the simplistic use of the item. Very easy setup if you read the instructions first. Great device for the price. Love being able to position my sub anywhere in my room without having to run cable and worrying about hiding it, etc... 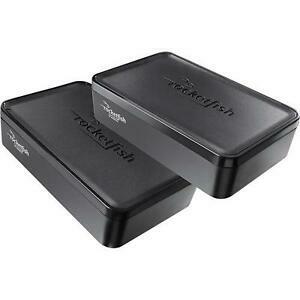 I have the Rocketfish wireless speaker system for my rear channel speakers too, so I am set! I will say that there is a random pop every once in a while with either system, which can be kind of annoying and it is quite a bit louder for the subwoofer system simply due to the size of the speaker, but it definitely does not happen often so well worth it to wirelessly connect these speakers! works as advertised. Sub does make a pop sound sometime when source material changes.